My favorite item is the box pleat top. I love those kind of shirts. The pea coats are so cute and I bet so comfortable! oooo what a cute peacoat!!!! I just entered the Kuru Shoe giveaway! I really like the draped front cardigan but my fave is the terry peacoat. Sorry, I forgot to put my name with the nhmummab@comcast.net first entry. My name is Tia. My favorite is the "Cowl Neck Long Sleeve". 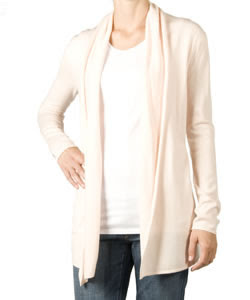 I love the 3/4-length V-Neck cardigans!